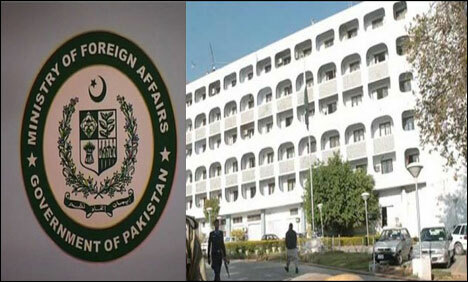 ISLAMABAD (92 News) – Foreign Office Spokesman Qazi Khalilullah has on Thursday said that Pakistan sought report on terror attack at its mission in Jalalabad. Addressing the weekly news briefing in Islamabad on Thursday, Qazi Khalilullah said that the Afghan government has been asked to investigate terror attack in Jalalabad and share the report with Pakistan. He said that Pakistan is ready to cooperate with regional countries including India to eliminate menace of terrorism, adding that Pakistan and India are in touch with each other to finalize date for Foreign Secretary-level talks. “I am not aware of any possible meeting between Indo-Pak National Security Advisers in Paris,” he said. The spokesman said that Pakistan strongly condemn bomb blasts in Indonesia, adding that we are against all kind of terrorist activities. He said that he cannot confirm the reports of taking Jaish-e-Muhammad chief into protective custody. Qazi Khalilullah said that Pakistan and Iran enjoy good brotherly and neighborly relations. He said it is expected Saudi Arabia and Iran will solve their issues through peaceful means.